Taste of traditional, primed in the present and locked in for the long term are three phrases that perfectly sum up the current career status of Kim Lowings and Lucy Ward. Of course the light of Lucy has shone a little brighter in wider circles, but they came together as kindred spirits to share the spotlight in the second instalment of the 2015 Stourbridge Folk Festival. 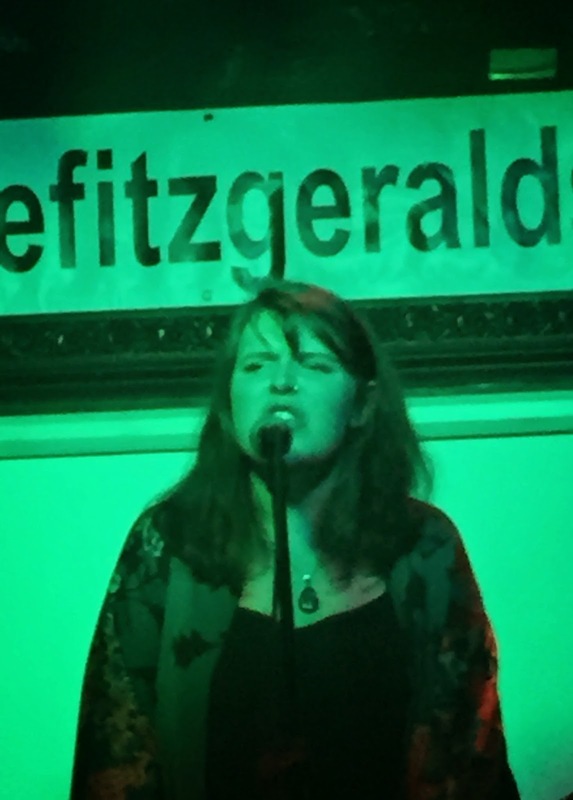 Splendidly described by Lucy as a ‘bunker’, the cellar bar at Katie Fitzgerald’s pub in Stourbridge hosted this memorable evening which was sprinkled with the gold dust of song, sound, prose and passion. Local artist Kim dutifully and gracefully opened for the Derbyshire based guest as Lucy was afforded a couple of sets to spice up a serene start to the show. Not that Lucy refrains from her more composed moments, but the feisty side of an exuberant persona ignites the flame to illuminate her craft, art and message. The handover between artists was a precise piece of cultural exchange as Kim hit her vocal stride with ‘The Parting Glass’ before being almost instantly followed by Lucy announcing her arrival with flamboyant panache. Both artists are in the throes of making that next record and took the opportunity to present a taster of the new material. Kim chose to share one of her more contemporary offerings with the track ‘Stay’ sounding immaculate on first listen and gave a hint that this new release is set to span the folk spectrum. ‘Connie and Bud’ and ‘Summers That We Made’ showed Lucy as being in fine fettle with the usual addition of inspired commentary being a fundamental accompaniment to each song, whether old or new. 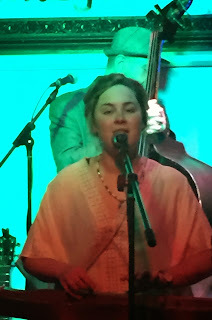 Kim, predominately on her trademark mountain dulcimer, was as usual supported by her backing trio The Greenwood and together they weaved through a set of familiar tunes, many of which have featured on her album and EP. ‘Phoenix’ and ‘Off to Sea’, both originals, headed the list and it was good to hear ‘The Wonderful Mr Clark’ again. The title of her new album was announced as Historia with hopefully the press to begin before the dying days of summer fade away. There is a guarantee you will be hearing a lot of it as the year heads into its final months, so stay tuned for more from a talented artist succinctly capable of gift wrapping each song with her idyllic vocals. 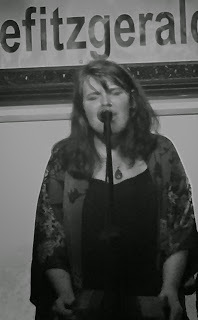 The enhanced versatility of Lucy’s vocals has led to a Folk Singer of the Year nomination to follow up a Horizon award for emerging artist. These imposing tones were wonderfully propelled around this intimate setting in diversely presented songs such as the spritely ‘Old Brown Hen’, the traditionally inspired original ‘Alice in the Bacon Box’, the wonderful ‘The Last Pirouette’ and the popular ‘Velvet Day’. This last song closed her first set, one in which Lucy opted out of playing stringed instruments due to a slight injury. This led to a late call up for an old friend in guitarist Albert Widdowson. The minor hindrance did not duly affect a couple of tunes being bellowed out on the concertina and harmonium with this temporary situation providing a further opportunistic spark for Lucy’s expressive mode of song delivery. The music of Lucy sways between the abstract and the earthy with the latter being intensely fuelled by her political stance, which like her music is a long way adrift from the centre ground. The prelude to the imposing pre-encore show closer ‘For the Dead Men’ paraded Lucy at her fiery best as well as the gratitude she showed to her hero Billy Bragg. This was perfectly captured in the WW1 tribute piece ‘Lion’ she wrote at Billy’s request when playing his choreographed Left Field stage at Glastonbury last year. This was much in a similar vein as the commissioned song ‘Creatures and Demons’, based on the famous Elizabeth Gaskell novel North and South. 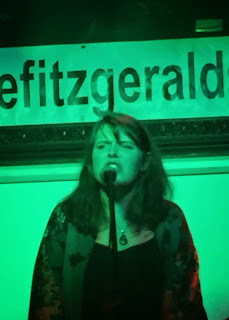 Just to cap the political leanings of the evening, Lucy couldn’t resist the request to cover Bowie’s ‘Five Years’ in light of that dark day of May 8. While on the topic of covers, a warm and affectionate audience had little trouble adding backing vocals to a version of ‘First Cut is the Deepest’ and Lucy celebrated her temporary reunion with Albert by returning to a song from their musical past in ‘I Will’ by The Beatles. This brought a momentous evening to a close which thrilled both audience and artists alike. Appreciation is forthcoming to the Stourbridge Folk Festival for presenting a show which went a long way in encapsulating the pioneering folk spirit of two artists stolidly representing their generation in the inspirational art of traditional and contemporary song. Erase the observational differences between Kim Lowings and Lucy Ward and it will reveal two artists bound by a drive to fulfil the calling of their gift.